Ticketing: Tickets are available by clicking on the orange â? ?Buy Ticketsâ? button. If online ticketing is not available for your location, you can purchase your tickets by visiting the box office at your local participating cinema. Special Fathom Features: A special production previously captured LIVE in 2014 from the Bolshoi Ballet in Moscow, Russia. Fathom Events, BY Experience and PathÃ© Live are delighted to bring the timeless holiday classic, The Nutcracker, performed and captured LIVE from the Bolshoi Ballet in Moscow, to select cinemas nationwide on Sunday, December 18. Christmas would not be complete without the enchanting tale of young Marie and her Nutcracker prince! Danced by the Bolshoiâ? ?s principals, E.T.A. Hoffmannâ? 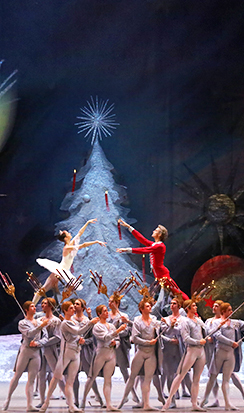 ?s fairytale staged by Russian ballet master Yuri Grigorovich will transport children and adults alike to a world of magic and wonder for the holiday season. Libretto: Yuri Grigorovich (after E.T.A. Hoffmann and Marius Petipa). Cast: Denis Rodkin (the Nutcracker Prince), Anna Nikulina (Marie), Andrei Merkuriev (Drosselmeyer), Vitaly Biktimirov (the Mouse King), and the Bolshoi Corps de Ballet. For more information about the complete Bolshoi Ballet 2016-17 Season visit the series page.